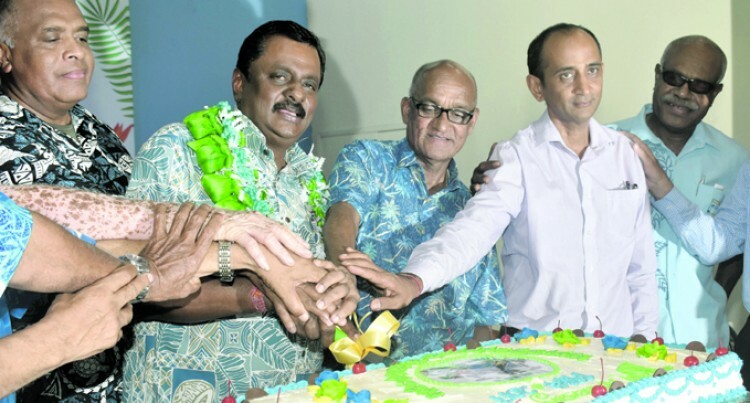 Minister of Infrastructure and Transport Praveen Bala with stakeholders cutting the cake during the pre-event launch of Nadi Town 70th Anniversary Celebration and City Declaration in Nadi yesterday. October 23,2107. PHOTO: KARALAINI TAVI. Nadi Town is soon to be named Fiji’s most liveable green city following the pre-event launch of its upcoming 70th anniversary celebrations and Miss Pacific Islands Pageant last night. Minister for Local Government, Housing, Envi­ronment, Infrastructure and Transport Parveen Bala confirmed Nadi’s new title during the Pre- Event Launch of three events at the Nadi Civic Centre. The three events are Nadi Town’s 70th anniver­sary celebrations, Nadi City Declaration and the Miss Pacific Islands Pageant scheduled at the end of next month. “This will be historic, Nadi to be first hosting the Miss Pacific Islands Pageant in Fiji. I know Nadi will put on its celebrations hat and host the event, as only they can,” Mr Bala said. Mr Bala thanked stakeholders, business houses and the people of Nadi for their support and posi­tive turnout at the event. “I wanted to have the Pre-Event Launch so that we all know the main events, and work together towards it,” he said. Mr Bala thanked the Nadi Town Council for being the main driver of the preparations for the events of which the pinnacle is Nadi being declared the third city for Fiji. “I will also be looking to all of you and Nadi’s cor­porate citizens to make the Nadi Town 70th Anni­versary Celebrations and City Declaration a grand and memorable one,” he said.